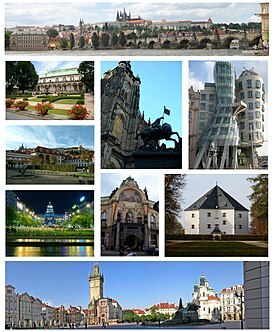 Montage o Prague, clockwise frae tap: Panorama o Prague Castle an Charles Brig, Dancing Hoose, Star Villa, Auld Toun Squerr, Wenceslas Squerr, Wallenstein Palace, Ryal Gairden at Prague Castle, St. Vitus Cathedral an Municipal House. Prague is the caipital an the muckle maist ceity o Czechie. ↑ "Demographia World Urban Areas" (PDF). Demographia.com. Retrieved 18 November 2013. ↑ "Czech Republic: Major Cities". CITYPOPULATION. Retrieved 13 May 2015. ↑ "Regional GDP per inhabitant in 2007" (PDF). Official site. Eurostat. 18 February 2010. Retrieved 22 April 2010. ↑ "Berlin - City Partnerships". Der Regierende Bürgermeister Berlin. Archived frae the oreeginal on 21 May 2013. Retrieved 17 September 2013. ↑ "Berlin's international city relations". Berlin Mayor's Office. Retrieved 1 July 2009. ↑ "Partner (Twin) towns of Bratislava". Bratislava-City.sk. Archived frae the oreeginal on 28 July 2013. Retrieved 5 August 2013. ↑ "'Frankfurt -Partner Cities'". Stadt Frankfurt am Main. Retrieved 17 July 2009. ↑ "Sister Cities of Kyoto City". City of Kyoto. Archived frae the oreeginal on 21 January 2014. Retrieved 21 January 2014. ↑ "Phoenix Sister Cities". Phoenix Sister Cities. Archived frae the oreeginal on 24 July 2013. Retrieved 6 August 2013. ↑ "Taipei – International Sister Cities". Taipei City Council. Archived frae the oreeginal on 2 November 2012. Retrieved 23 August 2013. Wikimedia Commons haes media relatit tae Prague. This Czech Republic-relatit airticle is a stub. Ye can help Wikipaedia bi expandin it. This page wis last eeditit on 6 Juin 2018, at 06:24.